This is for people who have run into trouble with these deals – either as a ‘buyer’, or someone who has been convinced to sell their house on terms. See how rent-to-buy houses works. WARNING: I’m not a lawyer. This is not legal advice. The information here is to give you some idea of options that may be available. There may be solutions for you which are not mentioned here. Promoters call these techniques “creative”, so your arrangement could be different to those outlined on this site. You should seek advice about your own situation. I don’t want to give false hope. Laws relating to these agreements can be difficult to navigate. However, my experience suggests that those who get legal advice or assistance may do better than those who don’t – but you might not get the result you are hoping for. You may want to make sure there is a reasonable chance you could own it – and then decide whether you should continue with the arrangement. If you haven’t had independent advice about your contracts, you may wish to get it now. It might be suggested that you go to a lawyer who has experience in these contracts – the problem is, that lawyer might take a lot of referrals from sellers and may have an overly optimistic opinion. Consider seeing a lawyer of your own choosing. You may be eligible for free advice from your local community legal centre, or you may wish to speak to a community financial counsellor. (Call 1800 007 007 for a free financial counsellor in your state). Are payments you are making towards the property secure? – for example who are they held by and how are the funds protected? What happens if you default? Do you have a right to any money back? Is the seller financially sound? What happens to you if the seller goes bankrupt, or fails to pay a mortgage on the property? Could you protect yourself by lodging a caveat on the property? Are you required to obtain mainstream finance to purchase the property? If so, in what timeframe? Is there a risk that when you try to get a mortgage, you will need to borrow more than the house is worth (and therefore be unable to get finance)? Is it likely that you will be eligible for mainstream finance when you apply? Unless you’re sure, speak to a bank or a mortgage broker. The lender or broker will need to know the value of the house. If the mortgage broker is recommended by the seller you may wish to get a second opinion. The seller (or agent) may not care whether you get finance or not, so don’t take their word for it. What is the current value of the house? It may be worth a lot less than the sale price you agreed to. If you can’t afford a formal valuation, find out how much similar houses have sold for (you can purchase this information for your postcode). If the contract has ended (ie you are no longer living in the house). If the contract has been terminated (ie you have left the property) you may wish to get advice to see if any money could be owing to you. Here are some of the case and legal issues that I’m aware of. If you see a lawyer or free community financial counsellor, use the issues on this page as a guide to what questions to ask. Misleading statements: In a recent case in Western Australia, rent-to-buy operators were fined for making a number of misleading statements, including “no banks home” and “we can buy your house fast”. If disputing your agreement this case may help you to identify whether any misleading representations were made to you (and were therefore in breach of the Australian Consumer Law). In this post, “seller” means the person or business on the contract as the seller or the landlord and “agent” means any person or business that arranged the agreement. The contract will probably be covered by the National Consumer Credit Protection (NCCP) laws. [National Consumer Credit Protection Act 2009]. This means that the seller, and the agent, should have a credit licence. If someone has a credit licence they will be a member of an industry ombudsman scheme which can deal with your dispute at no cost to you. There are two schemes for credit – the Financial Ombudsman Service (FOS) and Credit Ombudsman Service Ltd (COSL). Contact FOS and COSL and give them the name of the seller and/or agent, as they appear on your contract and ask if the seller or the agent is a member (if they don’t belong to FOS or COSL, see below). The NCCP allows a court to reopen (cancel or change) a credit contract (including a vendor terms agreement) which is unjust. [NCCP, Schedule 1, S.76] If the seller and/or agent are members of FOS or COSL, consider lodging a dispute outlining your concerns about the contract and the way it was entered into. Include in your claim details about any misleading statements made to you (including about the likelihood of being able to get a mortgage to refinance later), misleading advertising, unfair pressure, unfair clauses in the contract, or whether it was reasonable for the seller to think you could afford the payments. A full list of considerations is found in S.76 of Schedule 1 of the NCCP. It could also be relevant to your case if you were discouraged from getting your own legal advice, and if you did get advice whether the lawyer was chosen by you or recommended to you by the seller/agent. FOS and COSL will try to get the parties to settle, but they have the power to make a decision which is binding on the lender or agent. If the seller isn’t a member of FOS or COSL. This gets a bit more complicated. A seller might argue that the NCCP doesn’t apply because the contract is not done as part of their business or it’s just a “one-off”. If the seller’s name is a business name, or if the seller has done a contract with anyone else, or if you can show the seller has other property investments, they probably should have a credit licence in order to do vendor terms agreements. It is up to the seller to prove they don’t need a licence – not you to prove they do. Contact the Australian Securities and Investments Commission (ASIC) and ask if the businesses/individuals hold a credit licence. Give ASIC any information about the seller and your contract. While there are large fines for providing credit without a licence, you won’t be able to use FOS or COSL if they aren’t licensed, so you should seek legal advice if there is significant money at stake. There is one type of case where it’s pretty clear that the seller doesn’t need a credit licence. This is where an agent has arranged the contract with a seller who was simply desperate to sell their home (and possibly in financial trouble) and who is unlikely to be lending in the course of a business. The NCCP won’t apply in this case, and you may need to go to court against the seller and agent. However the agent may be a member of FOS or COSL so you may be able to lodge a dispute against the agent with FOS or COSL. If you have a lease agreement with an option to purchase (you probably have two or three contracts – a tenancy agreement, an option to purchase agreement and an unsigned purchase agreement). You could take your case to a residential tenancy tribunal in your state. In one case the NSW Tribunal (CTTT) found that regular payments towards the option fee was actually rent, and that instead of the ‘purchaser’ being in arrears, they were ahead in rent payments. If a tribunal made a similar decision, it could enable you to stay in the home while you find alternative accommodation or have some of the option fee returned to you on the basis that is excess rent. See full decision here. 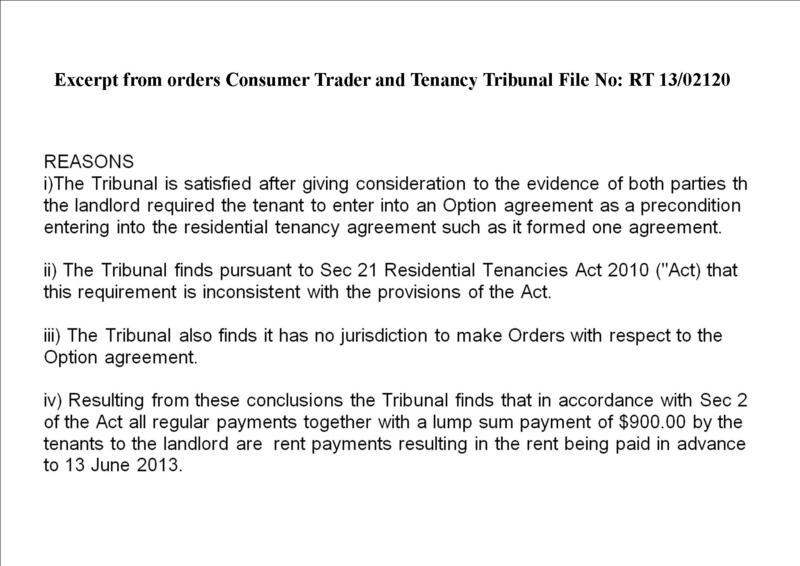 As well as going to a tenancy tribunal, you could issue a dispute in a consumer tribunal (if there is one in your state) in relation to the option agreement. Issues that could be relevant are any misleading (written or verbal) statements (for example about the likelihood that you could get finance) or terms in the contract which are unfair. The transaction could be found to be unfair (unconscionable) if it should have been clear that you wouldn’t be able to refinance, if unfair tactics were used to get you to sign or if it was clear that you couldn’t afford to pay the rent and option fees. In another case in Western Australia, the Supreme Court found that promoters of a rent to buy scheme misled purchasers about the future value of the property, the potential equity that they were able to build up over a four to five year period and their ability to obtain finance at the end of this period. If you didn’t deal direct with the seller, it is likely that the agent should hold an estate agents licence. While laws differ between the states, the court found in the WA case above that the promoters should have had an estate agent’s licence. Find out how you complain about an estate agent in your state, and ask how you might get compensation if you lose money as a result of their conduct. Some sellers sign these agreements with little understanding of the risks. You may have been misled about how long it would take to finalise the sale, or you may feel that unfair tactics were used to convince you to sell under a terms agreement. You may find that the person making the arrangements hasn’t properly vetted the purchaser and the purchaser may have damaged your property. You may be able to lodge a dispute against the agent in a consumer tribunal in your state if there were misleading statements or unfair clauses in your contract. While the agent may convince you to sign a joint-venture agreement, you may have a strong argument that they are, in fact, acting as an estate agent. Find out how you complain about an estate agent in your state, and ask how you might get compensation if you lose money as a result of their conduct. If you want to find out if you can terminate the agreement with the purchaser/tenant, you will need advice from a lawyer. See here for a case where a seller was successful in cancelling two lease options. Where to get advice? If you can pay a lawyer, contact the law society or law institute in your state and ask for a lawyer who can help with this problem. You may be able to get some free legal advice from a community legal centre. Be wary of seeking advice from a lawyer recommended by the seller or intermediary. A free financial counsellor can help you work through any debt issue and to determine whether you can afford to stay in the agreement (call 1800 007 007). If your agreement is a tenancy lease with an option to purchase, you may be able to get free advice from a tenancy advice service or tenancy legal service in your state. A Government Fair Trading (Consumer Affairs) office in your state may be able to help. These offices can conciliate some matters, and the seller (or seller’s agent) may agree to make an offer to settle the matter. However, if the seller (or agent) doesn’t want to negotiate, you may need to try something else. Whether you are thinking of going to a tribunal, industry ombudsman, or even if you are planning to see a lawyer, it will save time if you check this page, and this one, and identify what the seller (or agent) did that was unfair or illegal. For example, was anything said to you that you later realised was misleading? List the issues which you think apply to your situation. There is no one consumer law or agency for rent to buy contracts. Laws that might apply include residential tenancy law in each state, estate agent licensing in each state, sale of land laws in each state, national consumer law, and national credit laws. Until governments take action to improve the regulation of these deals, it will be difficult for consumers to decide where to take their dispute and what laws apply. As a general rule, if you’re not paying ongoing legal fees and you can go to a tribunal or industry ombudsman scheme, there’s a reasonable chance that lodging a dispute will improve the outcome, without you risking expensive court costs. While it may not benefit you directly, lodging a complaint with a regulator can help to stop illegal practices. There’s a chance it could help you get a better deal, but generally a complaint to a regulator is more likely to help stop the practices and help other consumers. For example, the Department of Commerce in Western Australia has taken action in relation to a number of businesses operating there. Rick Otton has signed an agreement with the Department not to run seminars in WA for two years. Agents may be licensed as estate agents with the relevant body in your state. Some agents and some sellers hold credit licences issued by Australian Securities and Investments Commission (ASIC). Consider giving details of your experiences to ASIC or the body that licences estate agents in your state (including a copy of your contracts with your complaint could be useful). Most people don’t report these problems, so your information is valuable to help these regulators take action to protect others. Finally, if you have concerns about the services provided by a lawyer in the process (for example if you think you received bad advice before you signed the agreement) there will be a complaints service in your state. For example, there is a Legal Services Commissioner in Victoria, New South Wales and Queensland who can prosecute lawyers for misconduct. Thankyou to Consumer Action Law Centre for assistance in compiling this information.